A hallmark of theater fans getting older is an increased willingness to sympathize with Benny, the landlord in the musical Rent whose bohemian non-tenants resent him for trying to charge them money. In a way, Ira Sachs’ Little Men attempts to update and lend nuance to this conflict for the vastly more gentrified New York City of 2016, where hardly anyone can afford bohemia and even struggling artists need a steady paycheck. 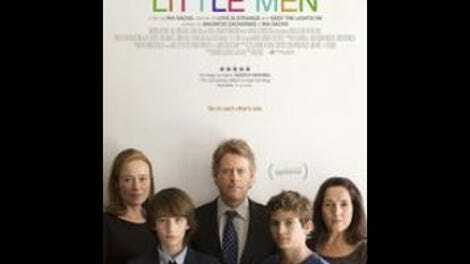 Brian Jardine (Greg Kinnear) is a New York actor, but his psychotherapist wife, Kathy (Jennifer Ehle), carries the family financially, while 13-year-old son Jake (Theo Taplitz) aspires to attend LaGuardia High School as a budding artist. When Brian’s father dies, the Manhattan-based family inherits his Brooklyn apartment, along with the storefront downstairs occupied by dressmaker Leonor (Paulina García). Her son Tony (Michael Barbieri) befriends the quieter, more sensitive Jake more or less on sight. It’s a boon to Jake in a new neighborhood, but the boys’ quick closeness only exacerbates the awkwardness of Brian’s attempts to raise Leonor’s rent closer to market level after years and years without an increase. Leonor believes that she should not have to pay more, because she was close with Brian’s father. Brian feels a responsibility to his family, including his sister Audrey (Talia Balsam), who technically co-owns the building and doesn’t get to reap the benefits of living there for free. On paper, this is a well-wrought dilemma, pitting New Yorkers with understandable points of view against each other without a clear solution. Brian is right to think that Leonor shouldn’t expect to pay the same rock-bottom rent indefinitely, and Leonor is right to think that her years of friendship with Brian’s father make her more than a tenant, subject to a sudden tripling in rent (which still, Brian points out, puts her well below market level). In practice, though, the tense exchanges between Brian and Leonor could have been imported from a middling off-Broadway play. Kinnear brings a subtle sense of conflict to the role—early on, after his father’s memorial service, the camera catches him saving his tears for a moment alone during clean-up—but spends a lot of the movie in goggle-eyed consternation. García expertly shows Leonor’s manipulative side, but she, too, barely has opportunity to change facial expressions. Sachs does much stronger work observing the friendship between Jake and Tony. He has a willingness to watch his young characters during low-key interactions, even if it means devoting minutes on end to kids doing acting-class exercises (Tony, also applying to LaGuardia, wants to act) or hanging out at an all-ages dance club. Tony wants to start chasing girls, and there’s a delicate ambiguity about whether Jake is more reticent due to natural shyness, or a different form of blossoming sexuality that he may not yet feel comfortable sharing with anyone, even his best friend. Sachs (Love Is Strange), working in rich colors and an unobtrusive (borderline static) camera, has come a long way since the stilted Married Life, and takes vivid snapshots of being young in New York. That’s not to say, though, that none of Little Men is stilted. When an adult woman says to her young son, “You should applaud your father for being adaptable,” it’s hard to tell if Sachs is telegraphing her background as a therapist, or if it’s just that his New Yorkers sometimes sound as foreign to the rhythms of human speech as Woody Allen’s. (Leonor isn’t as formalized, but she does sometimes speak in a bluntly expositional way that also recalls sub-vintage Allen.) The adult-centric material, especially when it’s not viewed through the kids’ eyes, doesn’t have the same naturalistic verve, even as it deals with recognizable real-world problems. The adult and kid worlds intersect when the boys agree to form a united front against their parents’ disagreement, without knowing a lot about the disagreement itself. This leads to a heartbreaking confrontation scene with Jake later on, but by that point it feels like too little, too late. This may be part of the film’s strategy, to show hard adult life choices encroaching on the boys’ adolescent reverie, just beyond their understanding. But the younger characters are so full of life, and the older ones so full of trenchant but predictable talking-point issues, that it sometimes feels like a middling movie encroaching on a good one.